As part of my obsession about the correctness of cask ale in Portland, I resolved to go sample some of the cask nectar at Rock Bottom. If you're skeptical of chain pubs, I understand, but Van Havig brews brilliant beer at the Portland RB branch, very worthy of your patronage. 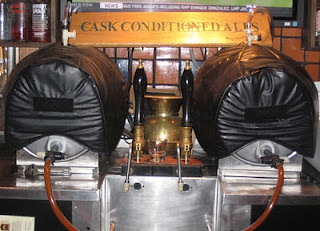 In particular, the cask-conditioned ales are treated with appropriate care at Rock Bottom. Just make sure you sit at the bar when you visit -- most of the waitstaff is in an extreme state of blissful ignorance about the beer, but the folks behind the bar will keep you informed. Charles was good enough to meet me there for lunch yesterday. Unfortunately, only one cask was pouring -- the Amber Ale -- and Charles and I got the last two pints of that. I asked, "Oh, are you going to throw another one on? ", a trick question that was correctly answered "No". I should have followed up to find out how long they do let the casks settle before serving, but I can only think of one trick question at a time. The Amber Ale was lovely, a little nutty and sweet, like an ESB with a little more floral hops. Quite a head on it for a cask ale, maybe because it was pulled through a sparkler. As you can see from the picture, the Rock Bottom setup is with real firkins, with filtered air coming in the top, as opposed to pumping beer out of a standard-issue keg. What got me jonesing for a Rock Bottom cask ale was this article on the Brewers Union 180 Blog, about the first firkins Ted has allowed to be served by someone other than himself. Block 15 in Corvallis has met his stringent handling requirements, so he sold them some of his ale after they sold out of their own cask-conditioned offering. The Block 15 blog itself has a very nice writeup of their cask system. Give it a read. Kudos to both pubs -- I've got to hit the road soon and visit them in person. Back to Rock Bottom: they are serving a fabulous barrel-aged version of last year's Anniversary Ale (an Imperial IPA). Aged in Woodford Reserve barrels, tons of vanilla and bourbon flavor on top of a very lovely beer. This year's Anniversary Ale is also on tap, but wasn't very impressive. However, the Black Peter -- labeled as a Belgian Porter -- is wonderful. It's got the delicious Belgian floral-yeast flavor on top of a dark, strong, smooth porter. What are those top hoses going to? I've been meaning to take a trip to Corvallis and visit block 15 too. Let me know when you get around to making the trek, I'd be up for meeting you there for a drink or two. Does anyone know how long it takes for a beer to be light struck? I was just looking at the photo and noticed you can see the beer in the hose. I assume they move the beer fast enough but I am curious. @Kevin: Dunno when it will happen, but I'll drop you a line if I go. @Mr. Murphy: both casks were empty when I took that photo, so I think the hoses are opaque, not beer-filled. Click on the photo for a closer look.